I've been too busy to blog much, but here's a quick collage of photos and events from March. It has come and gone like a lion. On one particularly warm day early this month, we did get to play outside for a few hours in the puddles and streams the melting snow made. The girls built snow castles in the driveway. Our homeschool is intensifying during this season, especially our work in Essentials, the English grammar and writing program for Classical Conversations. We are striving along and all the girls are making steady progress. I am still teaching group fitness classes part time throughout the week. Though it would certainly be easier not to work in addition to my other responsibilities, I like earning money and the exercise is proving to be a stress reliever. 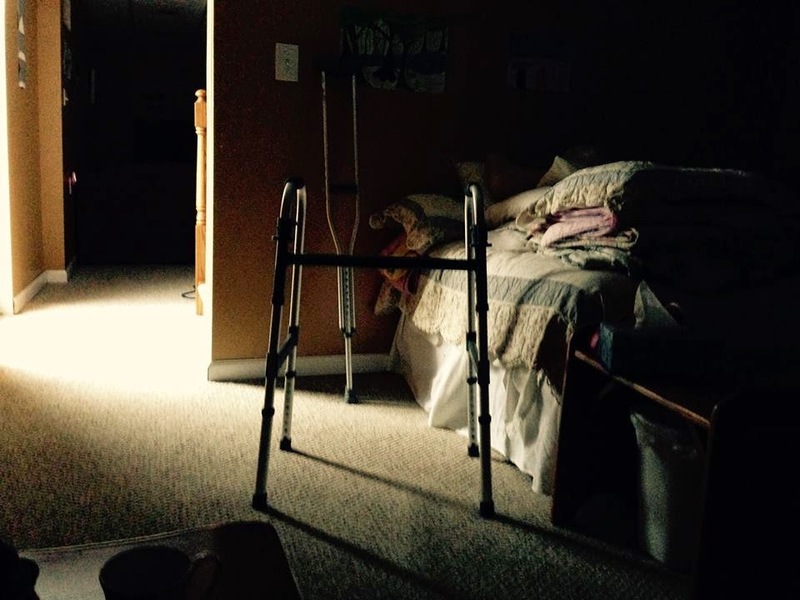 My husband is still recovering from having foot surgery at the end of April. 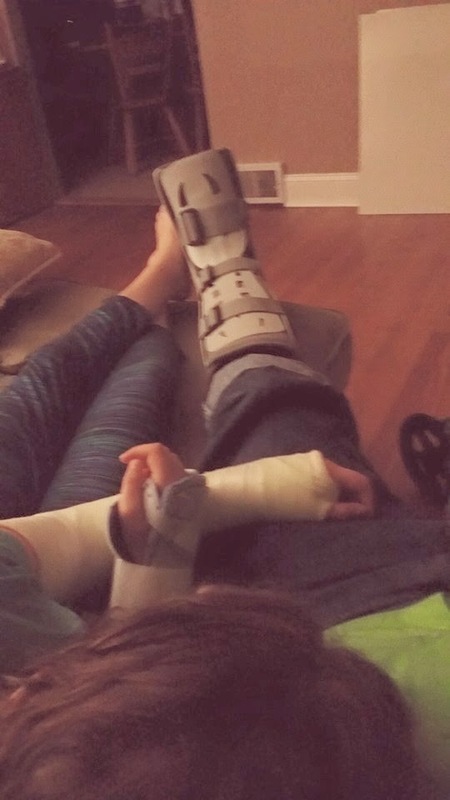 But, not to be outdone, our oldest daughter Norah tripped while playing with a group of kids, caught herself on both her hands, and fractured both her arms near the wrists this month! She and my husband make quite a pair- she with two casts, he with a boot on his foot. The picture below shows them on the couch relaxing together. Aside from doing her handwriting, our daughter was still able to do most of her schoolwork. 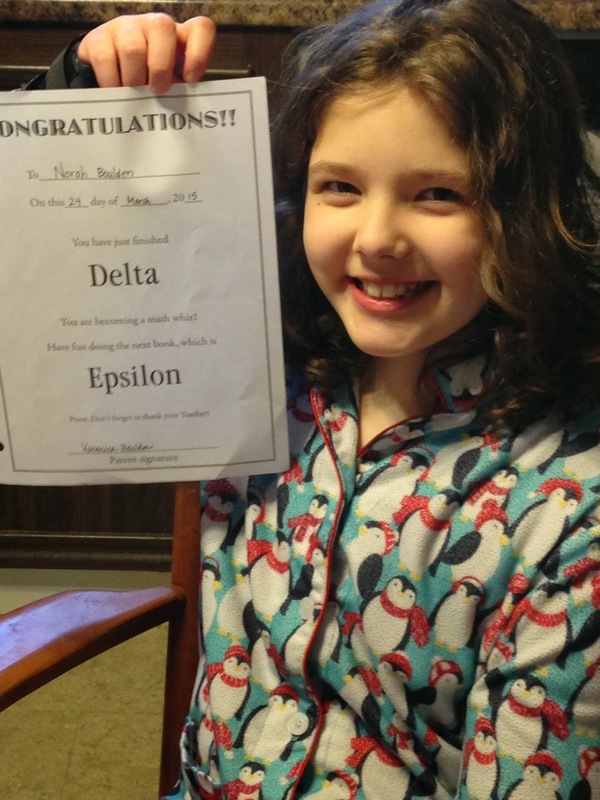 Below is a picture of her certificate for completing Math U See's Delta, taken a few days ago. Now on to the next book. Like the song says, we have had a little help from our friends. 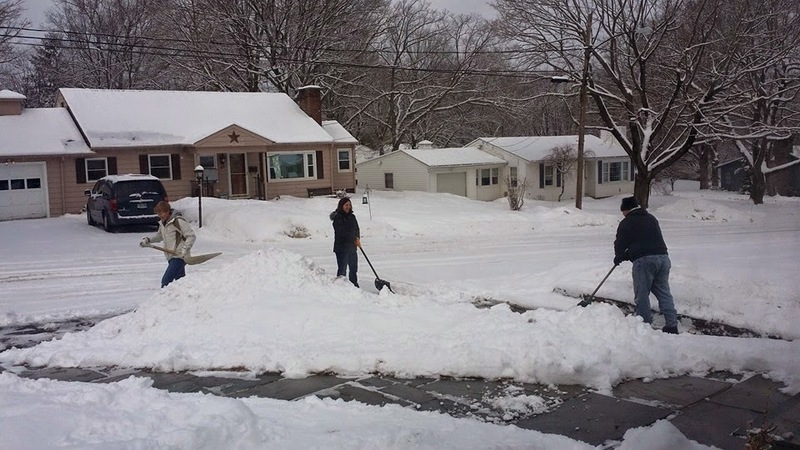 Below is a photo of the McCandlesses shoveling snow for us on one particularly busy Saturday when it snowed again. They were also the ones I called when I was stranded at the hospital with my daughter in the early morning hours. I took our two little girls to get desperately needed hair cuts a few days ago. 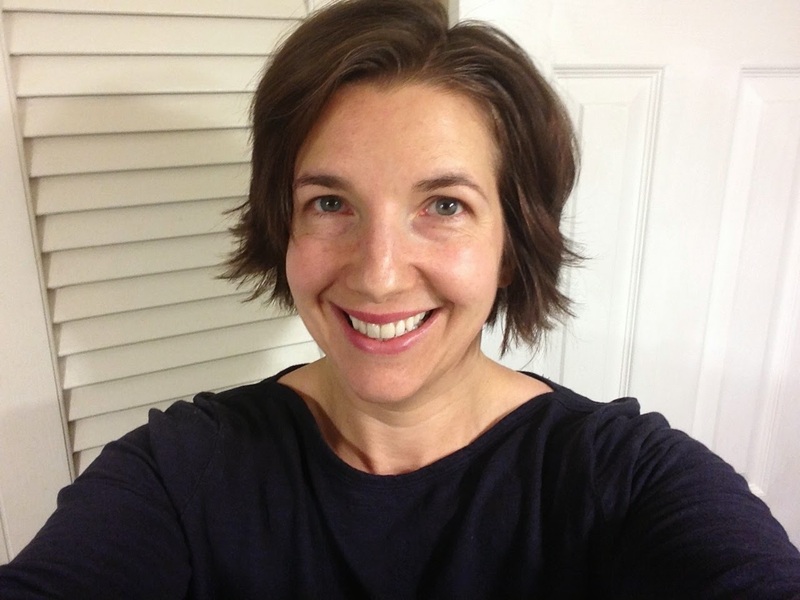 While there, I got my hair chopped off, something I have been considering for a while. I love it. 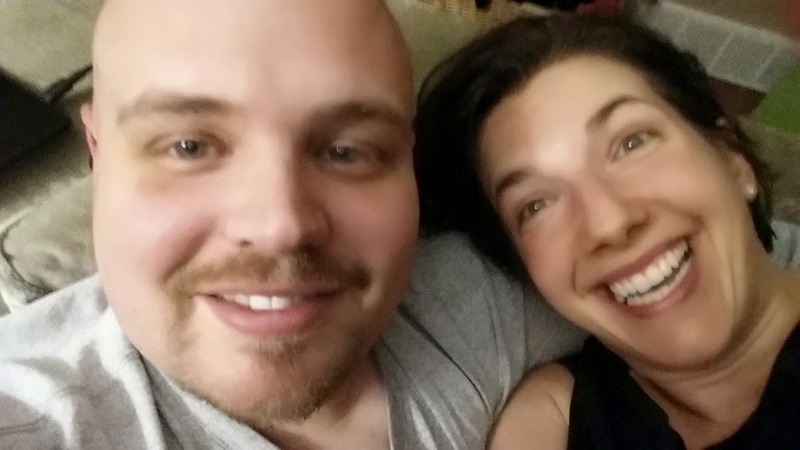 Here's a silly selfie my husband and I took after the kids were in bed one evening. He's had a very busy time at work and he is working on his master's degree at night, so we are stealing moments together as often as we can. 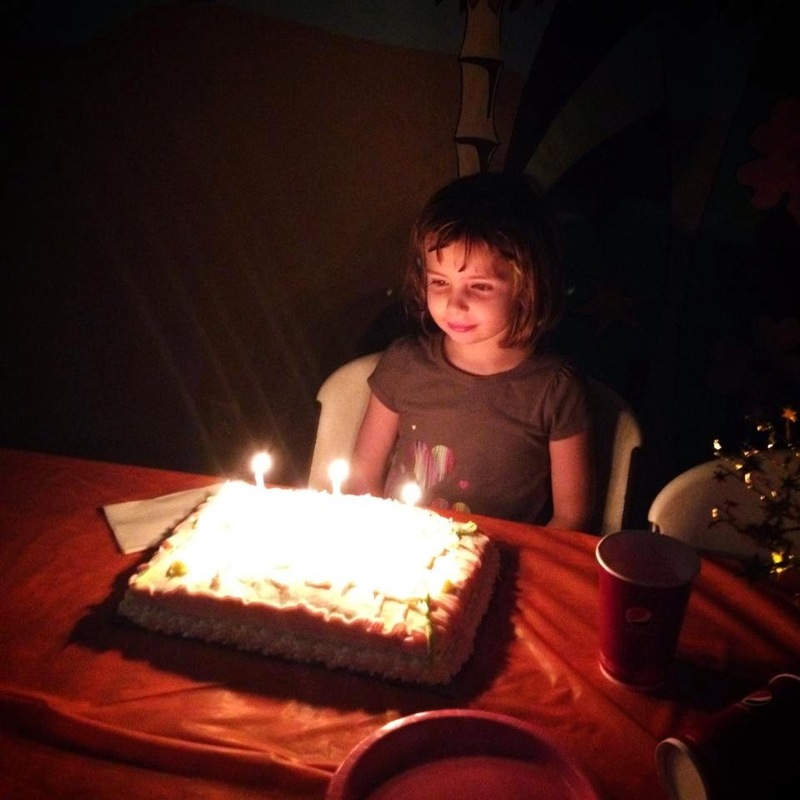 We got to celebrate our middle child's birthday this month. She turned six. On her birthday, we had her favorite meal, spaghetti, and then we had cupcakes and opened presents. The next day, we had a small party for her at an indoor water park. 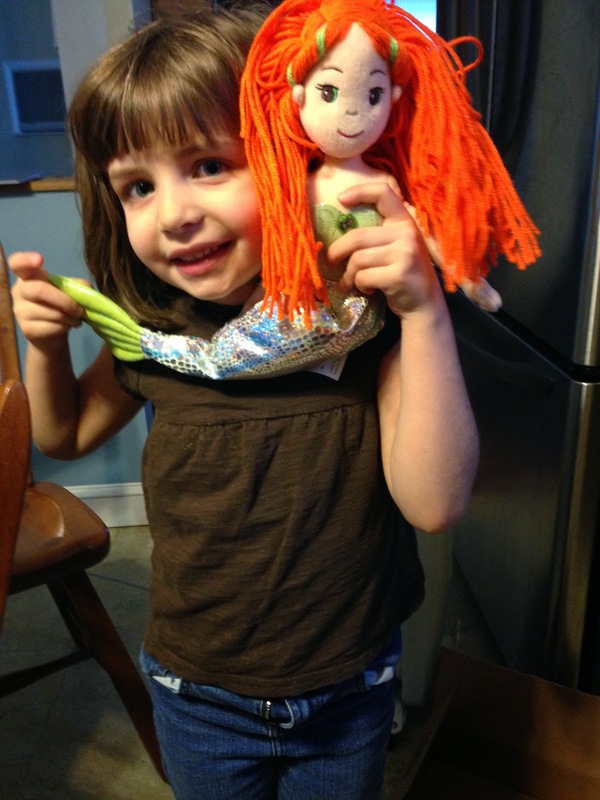 This birthday party is something she and her sister have been dreaming of doing for a long time. Because I was soaking wet, keeping a constant eye on our two year old, I didn't take many photos. 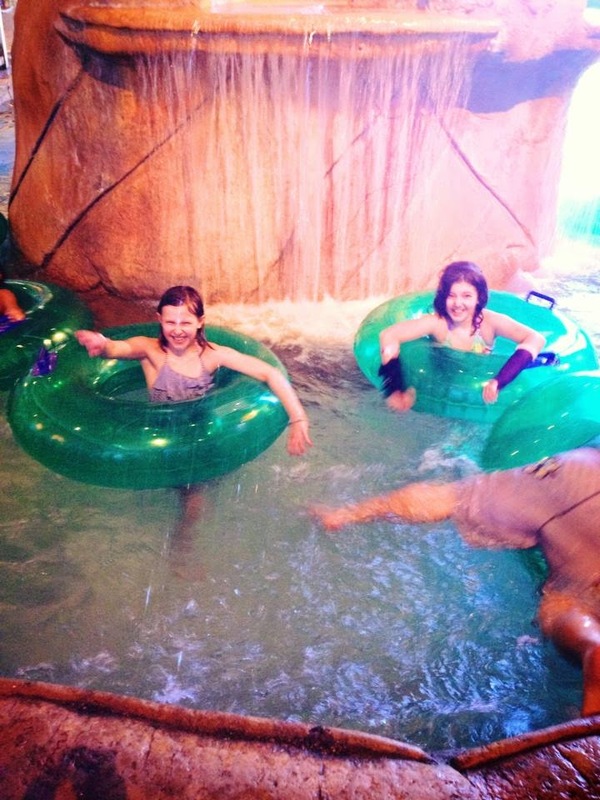 But here's a photo my friend Kim took of my oldest daughter and her daughter Sophie in the lazy river. 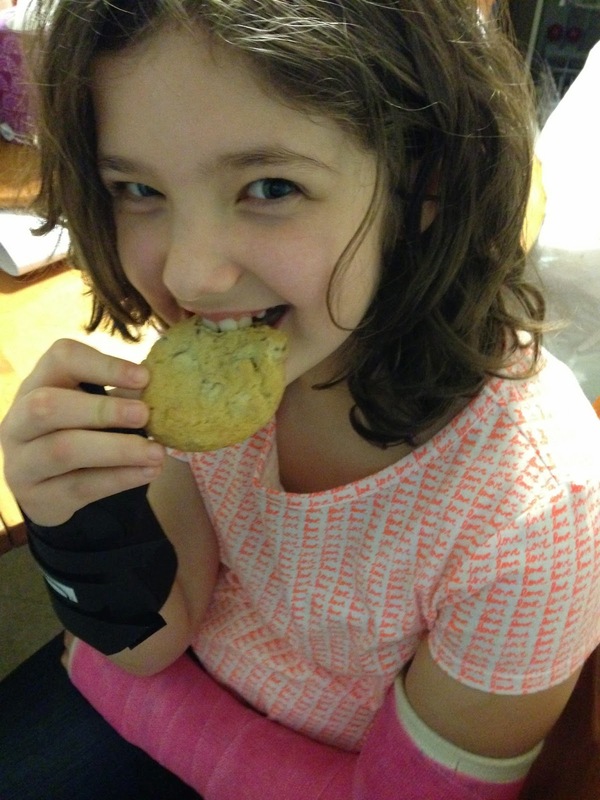 Note: Notice my daughter now has a shorter, water proof cast. She's healing quickly. Here's a sweet photo of our Avril and her cake as we sang "Happy Birthday" at the party. That's a brief overview of the month of March. It's been busy and even really difficult at times, but nevertheless, we know that we have so much to be thankful for. Several weeks ago, I was hoping to get one or more new fitness classes on the schedule at the gym where I have been subbing. But I wasn't given a class. I understood the practical reasons why I didn't get the classes. I am still a novice in their programs, there are much more experienced teachers in line ahead of me, and the gym has no real need for a new class on the schedule. Nevertheless, I wrestled disappointment for days. It seemed to me that I had been training for nothing. I took my disappointments to God in prayer, because that's usually what I do with disappointments. I had questions for God, because I thought He was leading me to do all the training, but nothing was coming of it, apparently. As I lay on my bed thinking and talking to my husband about the situation one morning, when there as a break in our conversation, I heard the Lord say, "I have my own purposes for your strength." Though I did not hear the words out loud, they came into my mind with perfect clarity; it was as if the Lord were right there with us, speaking to us, a third person in the room. More importantly, the words were delivered with great authority as if a king was declaring his will to members of his court. My spirit was quickened and I told my husband about what I felt the Lord has just said to me. We talked about what it could mean. We knew we were facing some challenges this season, including a surgery, so the words made sense. I took comfort, because the words were delivered directly, deliberately to me with tenderness. It felt as if the Lord totally understood the cause of my frustration, appreciated my situation, even cherished it. But the words were also spoken with firmness, so I was humbled. The words worked on me and it took a few days to process the implications of the message. "I have my own purposes..."
He spoke as if He were the rightful owner of my life, I thought. So He has been since before I ever even acknowledged Him as Lord when I was fifteen. So He would be the rightful owner of my life even if I refused to acknowledge Him as such now. Nevertheless, I wrestled with being a being made by another for another's purposes. As I have often done in this life of faith, I came to grips with the fact that I do not belong to myself, I belong to the Lord. I am His servant. I believe I am not limited as much by my physical circumstances as I am by His Sovereign will for my life. I believe whether or not a gym has a place for me matters much less than whether or not God has made a place for me at a gym. When I came to faith in Christ, I learned to call Jesus Lord, King, even Master. But over the years, I have also learned to call Him Father, Friend, and even Beloved. So it seems like it ought to be easier now to submit to His will. But my relationship with God is real and complicated, like any old story about a good king and his faithful courtiers. At times, even the king's closest servants have to submit to his will without a full explanation. So I chose to submit even though I did not fully understand. I know God well enough to know I ought to do so. But, after a few weeks time now, it is becoming clear that God had His good reasons for directing my fate as He did. My dad got sick and was put in ICU earlier this month. The fact that I wasn't working as much meant that it was much more convenient for me to go visit. I was free to fly down to South Carolina where he and my mom, sister, and brother live to visit him without taking off work. I served my parents for the few days I was in town. I brought my dad home from the hospital, cleaned my parents' house, ran some of their errands, cooked, helped them organize things like medication and their closets. Because I was so physically fit, I was able to go all day without needing to rest much at all. On the last morning in town, my sister and I took a queen-sized bed apart, loaded it in a truck, took it over to my parents, set it up, and then even disposed of their old bed at the dump. 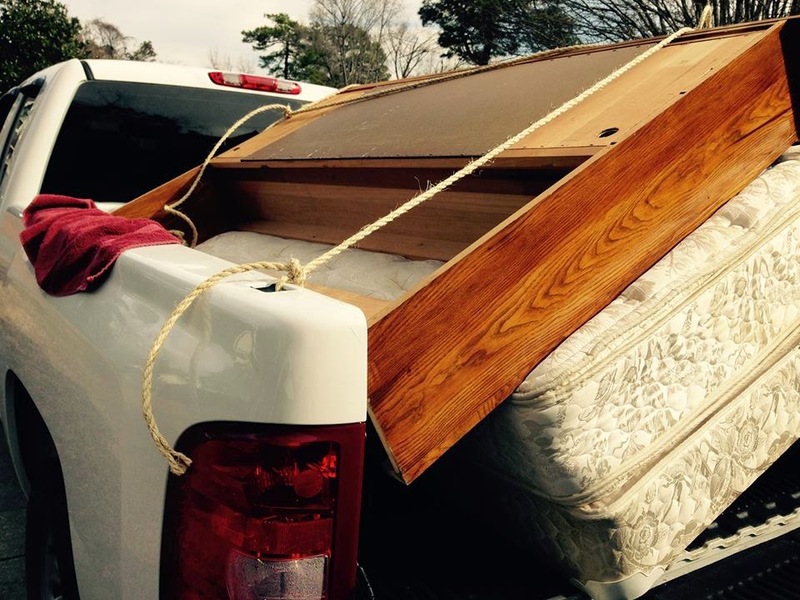 As we were loading the new bed into the back of my sister's truck, I felt the Holy Spirit remind of what God had said to me, "I have my own purposes for your strength." Another time, I would not have been strong enough to move that bed. Now, because of my training, it was quite easy, so easy I didn't even have to hesitate to do it. I took a photo of the moment, so that I could cherish it, and remember it to build my faith. A few weeks have passed since then and now I sit writing this in the corner of our guest bedroom as my husband sleeps. He is recovering from major surgery on one of his feet, the one we knew was coming when we talked about what God could have meant by His words to me. In my eagerness to get new classes at work, I did not consider the realities of having a person to care for 24/7. How foolish it would have been to add more work to my schedule at this time. The Lord knew I would put priority on being here for my husband. He also knew I would not want to fail my responsibilities to any employer and I was better off without more classes to handle. It's been sobering, to say the least, to have my stronger half physically cut down for the time being, even if the whole thing was planned. He and I have been a wonderful team, each working in their gifts, but now it's all going to be on me for the time being. If it snows, I shovel alone. Dwayne showed me how to use the snowblower a few weeks ago, so I am somewhat prepared. If the trash needs to be taken out, I pull it out to the curb and back. He usually does one or the other. I usually cook our meals, but now, my husband can't even get to his food without my help. 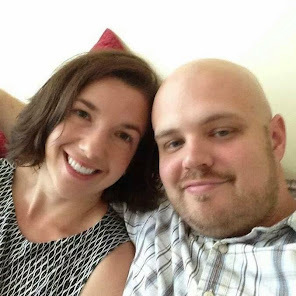 But, praise God, I have trained so hard, so I am physically strong enough for the task of caring for my husband and doing much more than I usually do in our home, too. I don't feel so totally overwhelmed. Just as God said, He has His own purposes for my strength. And so He will my whole life. Next time I do not understand why things are not working out the way I expected them to, next time I am asked to submit my will to God's will, I must remember that it's a privilege to simply wait on so a great a King as our King. Eventually, I always have the joy of seeing what He is doing with my life.